Choosing a VR headset can be a challenge for some people, especially if they have no prior experience with VR technology. Many people avoid cheap products because they tend to be lower in quality. That is not the case with these 11 VR headsets. 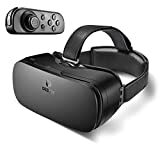 Although they all go for less than $50, they offer great VR experiences and are very qualitative for their price range. In this article, you will find the best VR headset under 50 dollars for you. We look at 11 top options, their main features, specs, and ratings, to help you find the best cheap VR headset for your virtual reality needs. This table will cover the specs of the first 5 best VR headsets under 50. This device is made using high-quality ABS plastic. It is very light and compact, making it a strong contender to the title of best VR headset under 50. In addition, it does not put any pressure on your nose bridge or eyes. It also has anti-blue coating HD optical resin lenses that help protect your eyes. The gadget is designed for use with all phones between 3.5 and 5.5 inches. You can sometimes find the Storm 3D headset on sale. This VR headset is perfect for beginners, since it is easy to operate. All you have to do is open the front cover by pressing the button found on the top of the headset, place your phone in, adjust the resin lenses using the designated button, and then just watch a movie or play a game. This headset from VeeR is extra light, which means you can wear it for a long time without getting tired. The adjustable headband also contributes to the comfortable feeling. You can use it for games, 360 photos, videos, live shows, and more. 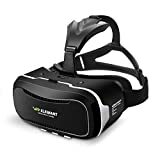 This tenth best VR headset under 50 is compatible with a wide range of smartphones between 4.0 and 6.2 inches. When you order this headset, you also get aVeeR VIP membership card that can be your go-to resource for free and qualitative VR content. The iRULU virtual reality glasses are both convenient and comfortable. The adjustable straps and soft face padding make it easy to wear for long periods of time, while the adjustable object distance and focus pupil buttons ensure that anyone can wear it, including people who wear glasses and have myopia. The company recommends using high-resolution smartphones if you want to get the best experience possible. This headset is compatible with smartphones between 3.5 and 6 inches, both Android and iOS. It does not work with Nexus 6P and LG 4G. This product uses high-definition optical resin lenses to deliver great VR images. People with myopia of between 0 and 600 degrees can use the product without glasses. The device has an ergonomic design. You can even adjust the volume with your phone controls. If you get blurry images, you can adjust the pupil distance and focal distance using the buttons on the headset. The front cover is easy to remove, due to its magnetic absorption feature. This helps keep your phone cool when using the headset for a long time. There are ventilation holes on both sides of the headset, and you can also use them to put on your earphones or charge your phone. 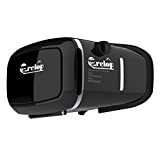 The Elegiant VR headset is designed with advanced heat dissipating technology. That means your phone will not overheat as you use the product. The headset balances the belt stress in three points to reduce pressure on the face. This makes it the best VR headset under 50 for people who spend long hours on the device. You can buy it for a particularly low price on sale. The lenses are high-quality and adjustable, providing a clear and vivid picture. You can adjust both the focal and pupil distance, which means this headset is good for people with myopia. The materials used to build this headset are environmentally-friendly. 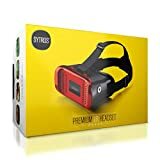 The Sytros VR headset is compatible with both iOS and Android devices, it is lightweight, and designed to provide an affordable, yet qualitative, VR experience. The device comes with high-quality lenses, and adjustable pupil distance and focal distance. If you’re worried that using this headset for a long time might be uncomfortable, you should know the design is naturally comfortable. The thick foam around the glasses is designed to frame your face comfortably. In fact, you can even wear your glasses under the Sytros headset. You don’t need to use a remote control with this headset, because it comes with an external magnetic button. This product has a 96-degree view, and it’s designed with thick and comfortable padding. Because of the comfort experienced, you might even forget that you have them on. This further improves the quality of your VR experience. The device is one of the cheapest VR headsets on the market. The seller often gives a discount on the product as well. The focus lenses on this headset are easy to control and fast. They provide a high-quality, crisp image. The inside of the headset is lined with soft plastic which works to protect your phone and ensure it won’t get scratched. The Hamswan VR headset has a sleek grey design. It is also very comfortable to wear, as it is extremely lightweight. You can make it even more comfortable by adjusting the headband. It is made with 42mm aspheric optical resin lenses to improve the quality of images produced. The pupil and object distances can also be adjusted to give you a more realistic VR experience. Besides the headset, your purchase will include a cloth for glasses and a user manual. This headset is compatible with a variety of smartphones, provided they measure between 4 and 6 inches. In case any parts of it are defective, they offer a 365-day quality guarantee. You can talk to their customer service team if you have any problems with your headset. 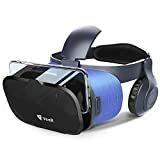 When you purchase this third best VR headset under 50, you will get a VR headset and 30 apps and games that you can use with it. It works perfectly with all smartphones with screens of between 4 and 6 inches. The headset has a wide field of view, and the images have absolutely no distortion. It is designed with three straps for adjustment. The inner part of the headset is made of a soft material that helps reduce stress on your face. All purchases are backed by a 45-day money back guarantee. If you order the NSINew VR headset, you also get a wireless remote that offers more control when playing games on Android devices. You can also use this remote on Apple devices, but with limited functionality. However, the remote also helps you control volume, video and music playback, and more, on both Android and iOS devices. With the second best VR headset under 50 on our list, you can enjoy panoramic 360-degree videos on your 4.5 to 6.3 inches smartphone. It works with Google Cardboard as well. The headset is designed with holes for ventilation. This helps prevent overheating of the headset, and also prevents the lens from getting foggy. The lenses can be adjusted in four directions, and this can be done separately for each eye. Another great thing about the device is that it’s lightweight. Many similar products will weigh down your head. If you want to use earphones while playing games or watching movies, there is a special hole where you can fit in an earphone or charger cable. 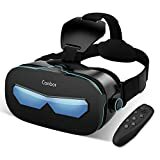 The number one best VR headset under 50 we will review in this article, the Canbor VR headset can fit smartphones between 4.7 and 6.2 inches. It is compatible with both Apple and Android devices, and it comes with audio-visual integration. It includes HIFI headphones with 360-degree surround sound. This is a great VR headset for people with hyperopia and myopia. The HD lens has an anti-blue light feature that protects your eyes from the damaging light coming from your smartphone. The field of view is wide (120-degree), perfect for people of all ages. This is a great headset to offer as a gift, since it is both affordable and high-quality. There are many virtual reality headsets on the market, some of them really expensive. However, you don’t have to pay a lot of money to enjoy great 360-degree HD virtual reality experiences. The devices covered above are all strong contenders to the title of best VR headset under 50, and are all very well designed. Most of them even rival products that are a lot more expensive. Leave us a comment below if you’ve ever tested one of these headsets. You can also tell us about the best VR headset under 50 you’ve ever tried.